The whole point of the nimble bots unveiled by a team of Georgia Tech scientists recently is to deceive bad guys while conducting missions. The news first surfaced on the September 3 issue of The International Journal of Social Robotics. If such a devious capability leaves you uncomfortable, do not fear. The robots won’t be seen in a battlefield for a decade at least. But why build such machines exist in the first place? The answer to that is survivability. If robots do have a keen sense of deception, they can better adapt to a hostile environment where they have to save a person’s life. While this is the goal, the actual experimenting to achieve it was quite mundane. 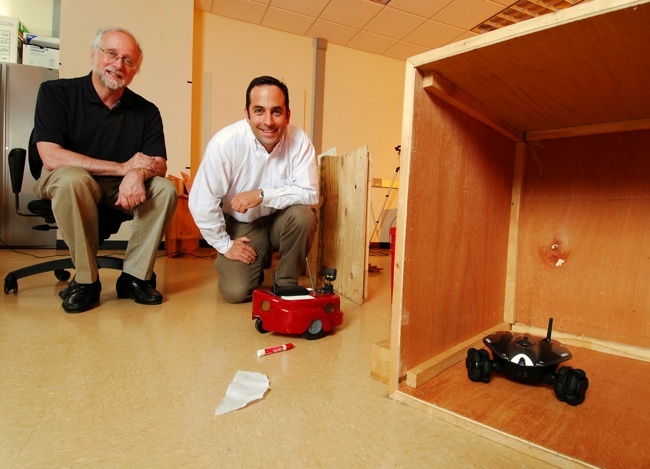 So mundane in fact, that the scientists performed hide-and-seek tests using RC race car robots. It worked by letting the hider robot knock over colored markers on its way to a destination, only for it to suddenly change course. The result was poor seeker robot got a tad confused—at least 75% of the time. Somewhere out there, we know SkyNet is laughing its evil laugh.